Child Sacrifice in temple worship with the god Molech. 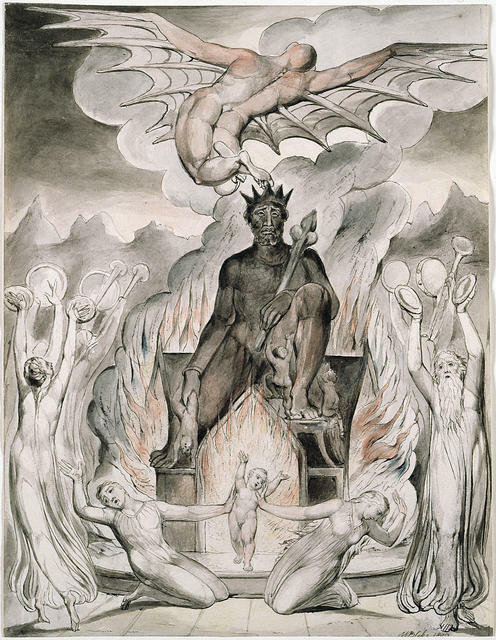 William Blake (1809), The Flight of Moloch. One of Blake’s illustrations of On the Morning of Christ’s Nativity, the poem by John Milton. Source . The book of Isaiah in the Old Testament portion of the Bible  is one of the most incredible books of prophecy ever written. Isaiah was a prophet during the time the northern kingdom of Israel was deported to Assyria in 722 B.C. But not only did Isaiah write about events that were happening during his own day, he also wrote about events that would happen hundreds of years later during the days of captivity of the southern kingdom of Israel after 586 B.C. He also wrote what are called the “suffering servant” Messianic passages that prophesied about the life of Jesus Christ which would happen more than 700 years later. So why did people create idols, and what did they trust them for? Idols were looked to for guidance, power, and healing. It seems strange to us today that people would create idols out of man-made objects created by their own hands. But the reason it seems strange to us today is because the people trusted in the spirits or spirit world represented by the idols, or in some cases they may have believed that the idol itself was inhabited by spirit beings. Our materialistic culture, by contrast, believes primarily only in the physical world. The typical things people have historically looked to idols to provide for them are: guidance, wealth, fertility, and health. God, the Creator of heaven and earth, presents himself to his people as the sole source of these things we need and desire. God does not act like a “magician” by providing these things for us out of thin air, but most of the time he works through his natural order of creation which is upheld by his power. The creation, however, is not a closed system, and he himself is not bound to its laws. He operates outside of it also, and in the person of Jesus, especially, we saw the power of the Creator in human form interact and overcome the limitations of the physical creation in many instances. Jesus walked on water, turned water into wine, immediately healed people’s diseases, and even raised people from physical death back to life. But the decision as to when supernatural events happen always originates with God, and not the created beings. The prophets and other leaders at times were used by God to perform miracles, but the miracles were performed by God through them. “Magicians” on the other hand, those who truly perform magic (not just illusions), are interacting with the spiritual world being controlled by their own thoughts and desires, or those of the spirits who are also created beings. How have we allowed this to happen? How does the population for the most part willingly believe in the medical system and give up so many of their freedoms and so much of their wealth to this system? There’s only one rational explanation: idolatry. We are simply repeating the same mistakes that have been made throughout history, when God is removed from our belief system and replaced with a belief in something else. We learn to trust in our idols instead. If history lasts long enough, I predict that a day will come many years in the future that will look back at our current day and culture and have the same feelings of repulsion and disgust that those of us feel today when we look at ancient cultures that trusted in graven images and spirits in their idolatrous practice. “How could they be so foolish to trust in those things?”, we think today, and in the future I suspect the same thoughts and questions will be pondered about our medical practices today. The winds of change are blowing already, however, as many are beginning to see just how far we have come in this blind trust we have in medicine. Some are stepping back to try and take an objective look at the effectiveness of our drugs, and what is being seen are some very troubling facts that can no longer be denied. First, depending on which set of statistics you look at, deaths from legally prescribed medicines and the administration of the medical system is seen as either the number one cause of death in the US today1, or the number three cause of death just behind cancer and heart disease2. This would include deaths from prescription drugs and hospital mistakes that are preventable. All of the statistics used to reach a conclusion like this are from standard published reports that come out of the medical system itself. Yet this is not widely reported in mainstream media, because of the belief that medicine and the medical system is necessary for life, and that therefore we have no choice but to put up with these mistakes and accidental deaths that are a direct result of medicine. Anything that is put forward as an alternative to the medical system for health is generally attacked and declared illegal, and if those from within the medical system decide to become “whistle-blowers” to speak up and try to reveal the failures of the medical system, they are attacked and they often lose their careers. This is especially true in the vaccine movement right now, which seeks to greatly increase the number of vaccines required to immunize children and now even teenagers and adults. Hundreds of thousands of parents know first-hand that vaccines have either killed or permanently damaged their children (and this is even backed up by statistics in the VAERS – Vaccine Adverse Event Reporting System – government database.) The medical establishment is aware of these side effects resulting in disabilities and deaths, but believes that these casualties are necessary for “the greater good” of society. Laws have been put in place to protect the manufacturers of vaccines from lawsuits, and a government compensation program was established to pay damages to those injured or killed by vaccines. Secondly, people are now starting to look objectively at the effectiveness of medicines, and what they are finding is very disturbing. This is especially true when it comes to psychotropic drugs within the field of psychiatry. Psychiatry is presented as a part of medical practice that supposedly has its basis in biological science, but it just simply is not true. There are currently no biological tests that can diagnose mental illness. None. Drugs are prescribed simply on symptoms. 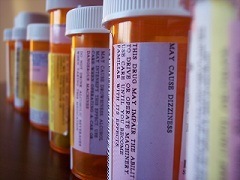 It is a $330 billion industry, and the number of antidepressant drugs prescribed has doubled in less than one decade. Most people don’t realize that the diseases these drugs are supposed to treat are diseases that psychiatrists vote on to include in their “Diagnostic and Statistical Manual for Mental Disorders” (DSM)3. There are no objective tests to detect these “diseases,” and the number of defined diseases that go into the DSM are increasing at an alarming rate, and now include such things that in the past were considered within the realm of normal behavior. One of the largest and most controversial ones is “attention deficit disorder” which is increasingly being used to prescribe strong drugs for children that are “overactive” and have “behavior problems.” Even unhappiness is now considered a disease, and drugs can be prescribed for that too. Critics point out that the DSM is so large now, that it can now cover the behavior patterns of the entire human population, and effectively label everyone now as having a mental illness. What a huge market for their drugs! As editor of Health Impact News , seldom does a week go by where I don’t see at least one story, and many now from mainstream media sources, questioning the validity of this increase in antidepressant drugs and their dangers4. These drugs are now being implicated in the increasing school shootings we are seeing so frequently in the news5, and to an alarming increase in suicide among our youth6. They are also being increasingly used with the elderly population who are often defenseless to defend themselves and stand up for their rights7. Idolatry is the reason we have allowed this medical system, which is so wrongly labeled as “healthcare”, to become as powerful as it is today. Some may think after reading this that I am opposed to all drugs and anything involved with the medical system. That is not the case. There are real drugs that are based on real science that obviously have great benefit, and can save lives. Antibiotics are a case in point. But our blind trust in antibiotics has led to such an abuse and overuse that they are losing their effectiveness. This is because over 80% of all antibiotics are used on animals8 in our industrial agricultural system, and it is estimated that of the other 20% or so used to treat human illnesses, about 90% of those cases antibiotics are used unnecessarily. If we continue to follow the current path we are taking, some feel that antibiotics will completely lose their effectiveness, making it impossible to perform life-saving procedures like surgeries or emergency room trauma care9. However, what is real “medicine”? Can we find this term in the Bible anywhere to give us some guidance? If you search for the word “medicine” in your English Bible, you will not find much. Usually the only verse in the Bible that uses the English word “medicine” is Proverbs 17:22: “A cheerful heart makes good medicine, but a crushed spirit dries up the bones.” This verse is hardly dealing with pharmaceutical products, obviously. The meaning is much broader than the strict understanding of pharmaceutical drugs. The Greek word pharmakeia, is translated “witchcraft” here, right next to “idolatry.” I wonder why the translators did not feel “medicines” was the proper translation? So herein lies the problem with “modern” medicine, which is not so modern after all. It all comes down to a matter of definition and use. Today, the word “medicine” is a regulated and carefully defined term to refer to only government-approved drugs, produced by the pharmaceutical industry. Natural substances found in nature, which are not produced by a pharmaceutical company, are not referred to as “medicine,” and most of the time to do so is to break the law and face arrest. Even the so-called “illegal drugs” in our modern day culture, such as marijuana, cocaine, and heroin, all have a previous history of verifiable medical uses. But they are generally illegal today*, not because they cannot cure disease, or because they are abused in recreational use, but because they cannot be patented by a pharmaceutical company and approved by the FDA. Yet, legal prescription drugs are more addictive, more abused, and cause far more deaths than “illegal drugs.” And natural cures such as food and herbs are not allowed to make health claims. So are modern-day man-made medicines any different from the idols of ancient times? They seem to function exactly the same way, by leading people to put their trust in man-made idols rather than God. And just as it is hard to imagine that people willingly gave up their children as sacrifices to the god Molech in ancient times (they were undoubtedly forced to do so), so too children today are being sacrificed to the medical system for the sake of “the greater good,” even against the desires of the parents. No, not much has changed at all. Don’t put your trust in the medical system! If you need to use it, make sure you have sought the Lord first, and that he is the one leading you to the right people and the right solutions. The prescription for dealing with sickness in biblical times was to seek counsel from spiritual leaders, not “doctors”. (See: Do Doctors Really Heal? ) Life is not dependent on the medical system, and often times there are natural solutions, and sometimes even supernatural ones. God is the author of all life, and he is the one who upholds it. Seek him first, and depend only on him! 4. Here are some examples: Ex-Pharma Sales Reps Speaks Out – Pharma Not in Business of Health  (Video), Antidepressant drugs do not work, and they have serious side effects  (includes Videos), The hidden tyranny: children diagnosed and drugged for profit , Psychiatry Biggest Offender in Mis-diagnosis and Unnecessary Procedures  (ABC News) – These are a small sampling stories. To view the most recent ones, click here .